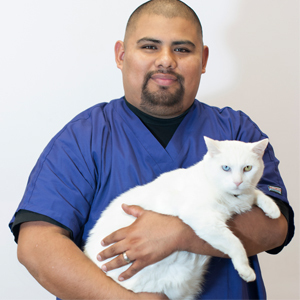 Hello my name is Eduardo and I have been working here at OCVMC since 2011 but I have been with the company since 2001 when we were formally called Tustin Ave Animal Hospital. In my free time I like to go to car shows and cruise in my “hopping” car with my friends. I have two blue nosed pit bulls name Mya (7 years old) and Nayla (4 years old). I like working here because I have made many friends, and I like to take care of animals.